Published on 5 April 2008. This 1,302nd post was filed under: Media, News and Comment. Comment posted at 05:49 on 7th April 2008. On the other hand, how many people can read their obit and complain about ow it is written? Isn’t it nice to see responsivle journalism? Comment posted at 16:23 on 7th April 2008. 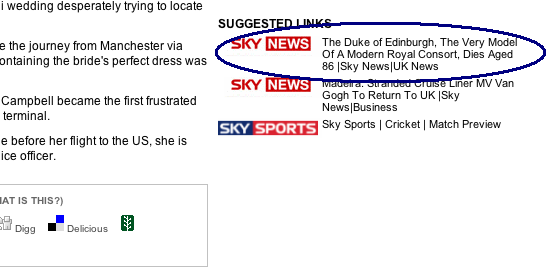 True, but is there anybody less likely to need to check over their obit than a British royal? We only do fawning when one of them pops off… no matter what we said about them in life.